Often overlooked as nothing more than a place to catch the ferry to Lombok or a fast boat to Gilis, Padangbai has a laid-back charm of its own. Start off your visit on the 12th (Tue): look for all kinds of wild species at Wildlife Areas. To find where to stay, more things to do, and tourist information, read our Padangbai vacation builder. Ubud to Padangbai is an approximately 1.5-hour car ride. In September, daytime highs in Padangbai are 34°C, while nighttime lows are 28°C. Finish your sightseeing early on the 12th (Tue) to allow enough time to travel to Tulamben. The small, otherwise unassuming fishing village of Tulamben draws scores of tourists every year as the site of a sunken U.S.
On the 13th (Wed), discover the deep blue sea with a scuba or snorkeling tour. Get ready for a full day of sightseeing on the next day: contemplate the long history of USS Liberty Shipwreck and then kick back and relax at Jemeluk Beach. To see reviews, traveler tips, where to stay, and tourist information, go to the Tulamben sightseeing planner. Drive from Padangbai to Tulamben in 1.5 hours. Wrap up your sightseeing on the 14th (Thu) early enough to travel to Nusa Lembongan. On the 15th (Fri), relax and rejuvenate at some of the top local wellness centers and then identify plant and animal life at Devil's Tears. Here are some ideas for day two: take in the views from Yellow Bridge, relax in the rural setting at Seaweed Farming, Nusa Lembongan, and then take a peaceful walk through Mangrove Forest Nusa Lembongan. 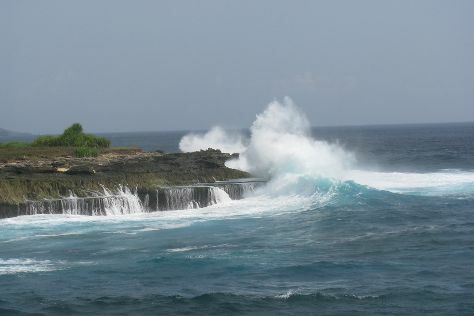 To see reviews, maps, photos, and more tourist information, read Nusa Lembongan tour planner. 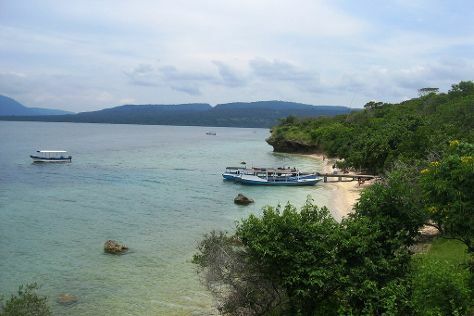 Traveling by combination of taxi and ferry from Tulamben to Nusa Lembongan takes 1.5 hours. September in Nusa Lembongan sees daily highs of 34°C and lows of 28°C at night. Finish your sightseeing early on the 17th (Sun) to allow enough time to ride a ferry to Kuta. Formerly a sleepy fishing village, the beach resort town of Kuta now represents one of Indonesia's most popular tourist destinations. Discover out-of-the-way places like River Rafting & Tubing and Blue Point Beach. Explore the numerous day-trip ideas around Kuta: Uluwatu Temple (in Pecatu), Tanah Lot Temple (in Beraban) and Ubud (Saraswati Temple & Sacred Monkey Forest Sanctuary). Next up on the itinerary: make a splash at Waterbom Bali and soothe aching muscles at some of the top local wellness centers. For other places to visit, traveler tips, and more tourist information, you can read our Kuta itinerary builder. Getting from Nusa Lembongan to Kuta by ferry takes about an hour. In September in Kuta, expect temperatures between 35°C during the day and 27°C at night. Finish up your sightseeing early on the 20th (Wed) so you can go by car to Pemuteran. The small fishing village of Pemuteran, just off the west coast of Bali, has become a popular tourism destination among domestic and international visitors for its scenic, pristine beaches and vibrant local community. Step off the beaten path and head to Menjangan Island and Brahma Vihara Arama Buddhist Monastery. Take a break from Pemuteran with a short trip to Walking tours in Buleleng, about 1h 05 min away. There's still lots to do: look for all kinds of wild species at Wildlife Areas, make a trip to Pulaki Temple (Pura Pulaki), and take a stroll through Seririt Market. To see traveler tips, maps, and other tourist information, read our Pemuteran trip itinerary maker. Getting from Kuta to Pemuteran by car takes about 2.5 hours. Other options: do a combination of bus and taxi. Cap off your sightseeing on the 23rd (Sat) early enough to go by car back home.